It’s a cold Friday night in October on the football field. The air is crisp. A group of young men are strug­gling and yelling, their breath coming in clouds. A coach’s whistle blows, and they col­lapse, exhausted. This isn’t Friday night football. This is the Hillsdale College baseball team in the off season, and they’ve just fin­ished lunging the length of the field with a tele­phone pole for weight. This is Mental Toughness Friday. Four years ago, Strength and Con­di­tioning Coach Patrick Gifford came to Hillsdale to help train Hillsdale College ath­letes, and met with Baseball Head Coach Eric Theisen and his father, Assistant Coach Gordon Theisen, before the team returned to campus for the fall. 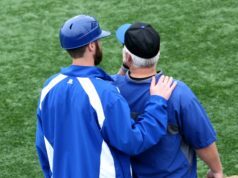 The Theisens, who were hired two years prior, had an idea for improving the baseball team’s mental approach to their game. To do this, Theisen pro­posed what he called “Mental Toughness Fridays,” a par­tic­u­larly tough workout at the end of the week, with the purpose of strength­ening the players’ ability to push past failure. The dif­ference between losing and winning, Theisen explained, is almost entirely mental. But while Theisen described a kind of cal­is­thenics — such as sprint drills, planks, and situps — as his original plan for the Friday workouts, Gifford had other ideas. Some of the workouts still “live in infamy,” according to Gifford, espe­cially that first one, in which each team carried a tractor tire — some still filled with rain­water and sloshing the guys in the face — out to Hayden Park, flipped it around a baseball diamond, and carried it back up the hill. The goal is to get the guys to push back against road­blocks that might come up, whether at the pitching mound, in the dugout, or even later in their lives, according to the strength coach. Often, the chal­lenge appears to be greater than it actually is. Four years later, Senior Kevin Monson said it felt “really good” to be among the first group to com­plete Mental Toughness Fridays, or “MTFs,” for all four off-seasons. Senior Christian Rodino explained that along with the MTFs each Friday during the off-season, the baseball team also has a week of MTFs at the end of October, before going into their short season. Some of the workouts during MTF week are more fun, such as 7-on-7 flag football and team relay races in the indoor pool. Gifford described how senior Joshua Hamrick — “a skinny, freshman pitcher who looked like he’d never worked out a day in his life” — handled his first Mental Toughness Friday. Though later Gifford would only require players to squat 60 percent of their maximum, the first version of this workout wasn’t so easy. Rodino said he’s found this to be mostly true, but for dif­ferent reasons. Ulti­mately, Gifford said, this makes a dif­ference in the players’ game-day endurance. “If they’re down late in the game, maybe it’s game two of a double-header, and they’re tired and they’ve played 17 innings of baseball already, it’s still not nearly as hard as some of the stuff they’ve had to go through on Fridays, and be suc­cessful. It builds con­fi­dence in them­selves, but also in their team­mates and the team as a whole,” he said. What’s good for the team, however, is not always the most enjoyable. When asked about the players’ response to the workouts, Coach Gifford laughed. “It’s a mixed bag. They embrace it, they know it’s a part of it. The baseball coaches know with the recruits that they bring in to visit campus in the fall, they bring them in on a Friday so they can see a Mental Toughness Friday. As Coach Theisen has said, if that scares them, we don’t want them,” he said. Theisen empha­sized the benefit of the MTFs on the players’ com­mu­ni­cation and coor­di­nation skills. “When it takes a whole team to carry a big railroad tie or tele­phone pole across the field and do curls with them or lifting them above their heads, those are always things that require timing and teamwork. The other things I really enjoy seeing are when players are pushed phys­i­cally to exhaustion,” Theisen said. “They like to con­sider them­selves gritty,” he said. Grit­tiness aside, however, nothing is met with more hap­piness than the end of the Friday workouts. “I had one guy in the past who grad­uated who told me that on Fridays he couldn’t eat all day, because he was so nervous and anxious about what I’d make him do. And then as soon as it was over on Fridays, his whole house would go up to El Cer­ritos and just smash dinner,” Gifford said. This year’s senior class, as the first class to com­plete all four years, “cel­e­brated big time,” according to Gifford. “The joke is, ‘I never have to do that again,’” he said, laughing. Inter­esting concept. Coach Theisen and Coach Gifford are smart cookies. I’ve been fol­lowing the baseball and softball teams on the video links. We’re close to being good teams in both cases, the pitching just needs to be more con­sistent. Our pitchers are good now, but they lack endurance. That will come with time and they are almost there now. And I think our hitting is also improving, along with the warming weather!